Let met start by saying that if you are a Star Wars fan, you must watch this episode before you can possibly see any spoilers. If you missed the premier, there are links all over on YouTube, or maybe a friend recorded it on their DVR. Just find a way to watch it, then come back and read this review. First off, the premise for the episode is that power is lost at the Griffin household and Peter must entertain his family with the story of Star Wars. The opening was pretty funny, but the Bush/Cheney bumper sticker on the back of the Star Destroyer really sets the mood for the rest of the episode. The parallels drawn between the oppressive Empire and United States are pretty obvious. There are really three types of jokes in this episode: 1) dirty jokes, 2) political jokes, and 3) those aimed at inconsistencies in Star Wars. I think that in the end the cheap shots at Star Wars end up being the funniest. My favorite is the bureaucratic approach to exhaust port flaw in the Death Star. Part of the fun in this episode is discovering which character is playing what Star Wars role, assuming you haven’t watched the previews or looked at the posters. Herbert is probably the most obvious foil for Obi-Wan. Of course the cheap shots aren’t all aimed at Star Wars, as at the conclusion the Family Guy writers criticize themselves for stealing the idea of a special episode from Robot Chicken (which clips can be viewed at Adult Swim). I think that both episodes are hilarious, but come from two totally different angles. 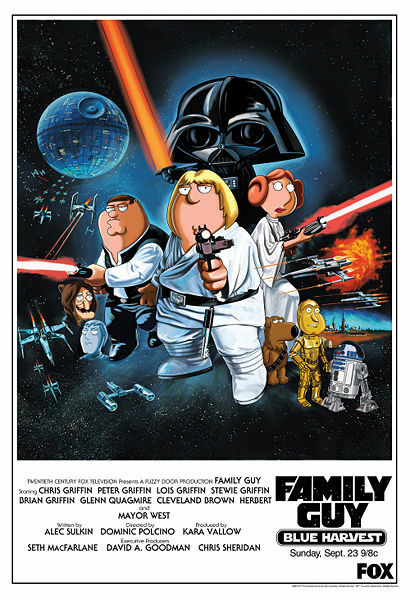 The Adult Swim episode is more like a series of skits which cover a variety of scenes from the various Star Wars movies while the Family Guy premier Dark Harvest covers one whole movie from start to finish. I was amazed at how much content of the movie made it into the approximate 45 minute run time of the episode, 60 minutes if you count commercials. I am not sure if I have just watched Star Wars too many times or not, because it seemed like they covered almost all of the important scenes. Also, the jokes are funny enough laugh at for at least a second time, as I watched this episode again with a friend a few days later and enjoyed myself. So, if you haven’t seen the episode yet, find a way to watch it or else you are missing out on tons of laughs.